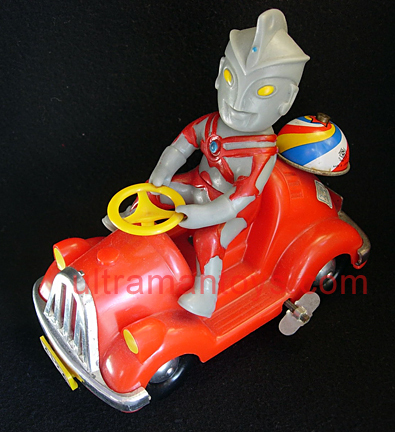 Ultraman Ace .. driving ? Don’t ask me why but my favorite Ultraman brother is Ultraman Ace. I actually didn’t grow up watching the original Ultra Ace show and only much later did i see an actual toy of Ultra Ace … but still something about the design really appeals to me. So in addition to collecting figures of all the other Ultras, I do make a effort to track down most eveything vintage on Ace I can find … this particular find was very cool to finally get. For the last 4 years I’ve only had the upper body portion of this figure.. and couldn’t figure out if he was suppose to be on a trike or car.. well as one can see he’s on a car ! Features include ringing bell on back and you can steering him by moving the license plate left or right, this moves the wheels in either direction. Made by Modern Toys, Japan, most likely 1972-73.